Are You Getting the Best Performance from Your Agents? Are you getting the best performance from your agents? Is there something you can do to get better performance and results?Have you ever considered that you have the power to do that? Great question, huh? 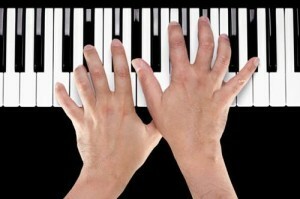 In fact, if we trainer/coach types knew that answer, we could build our systems so that we assured great performance! We don’t talk about ‘performance’ in the real estate industry. But, isn’t that the key to more production and profits? If the agent doesn’t do great lead generation, do exceptional presentations, and use exceptional performance skills working with and closing clients, the agent fails — those are all performance issues. 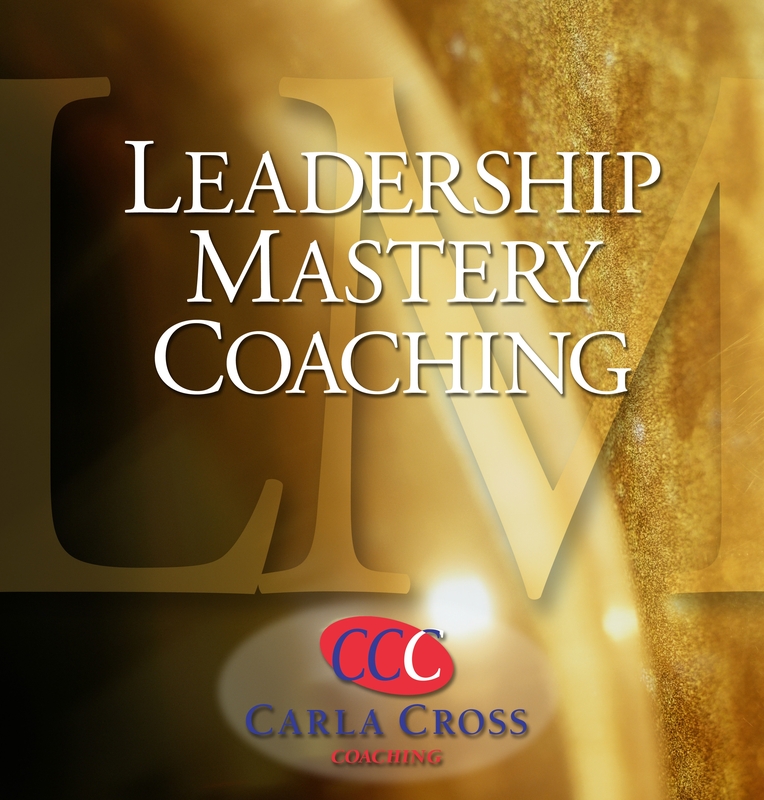 From talking with prominent trainers, managers, and coaches, we’ve pinpointed a need for all those training and coaching today to get the coaching they need to turn out great performers. 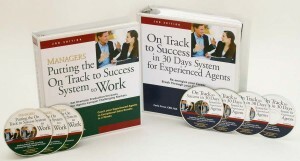 These are the systems I’ve integrated into my training programs, such as Up and Running in Real Estate. Are you integrating these 5 performance points into your coaching and training? 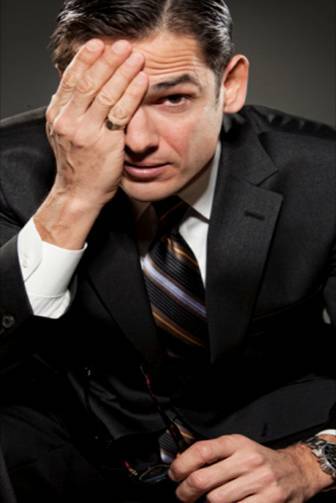 Four Tips to Avoid Hiring an Agent from He……. Let’s be honest. Have you ever hired someone and found out it was the ‘hire from hell’? If you haven’t, you just haven’t hired enough agents or staff!A� Many managers tell me that the hardest thing they have to do is to hire staff. 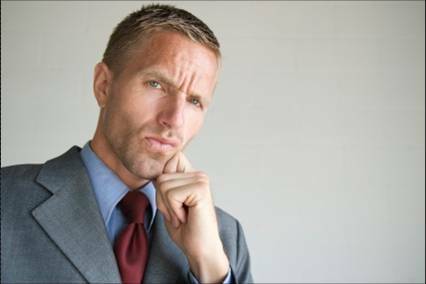 I think that’s because most of us never had any training in how to hire staff (or hire agents, for that matter).A�During a 3-day management symposium I taughtA�in South Carolina, and one of my students emailed me: “Can you give me some tips toA� assure I don’t make a hiring mistake with staff? If any of us hasn’t made mistakes hiring staff, please comment! I know I’ve made many–and that’s why I’ve developed the tips here. This tips work for hiring agents or staff. And, they work for agents hiring team members. Using that job description you created (you did create one, didn’t you?) for your agent or staff position, create past-based questions that tell you if the candidate has the skills and qualities you need. For example. You’re looking for someone who cares about the company. Here’s the question: “In your past jobs, give me 3 examples of how you watched out for the company’s best interests.” Listen and probe. Here’s an example for hiring agents. Let’s say you want an agent who is a ‘self-starter. The question: “Was there a time in your past when you wanted something badly, and you went out and got some kind of job to earn it?”A� Listen and probe. Now, you have those four surefire tips to avoid staff hiring mistakes. Let me know how they work for you!How’s Professional is Your Interview Process? So You Think Poor Hiring Practices Don’t Cost You a Thing….. So, you think poor hiring practices don’t cost you a thing, right? Most brokers dona��t realize they are doing irreparable damage to their companies by hiring those who arena��t going to go right to worka��and keeping those who wona��t work. Here are the 3 biggest consequences to poor selection I see. Likes attract. How can brokers hope to hire that great producer when they have more than 10% of their office as non-producers? I can see it now. a�?Sure, Ia��ll come to your office. Ia��m a top producer, and I just love to be dragged down by those non-producers. It will be my pleasure to waste my time with them.a�? Not. Will Your Market Cover Up Your Practices? In a fast market, a�?accidental salesa�� buoyed poor agents and made them look as though they were actually selling enough real estate to be a a�?mediana�� agent. When the market left, so did the agentsa�� a�?miragea�� of decent production. Now, brokers need to hire with purpose (using a stringent, professional interview process). Then, they need to put agents right to work with a proven start-up plan. Want some assistance in developing an effective system to hire those who actually go to work? 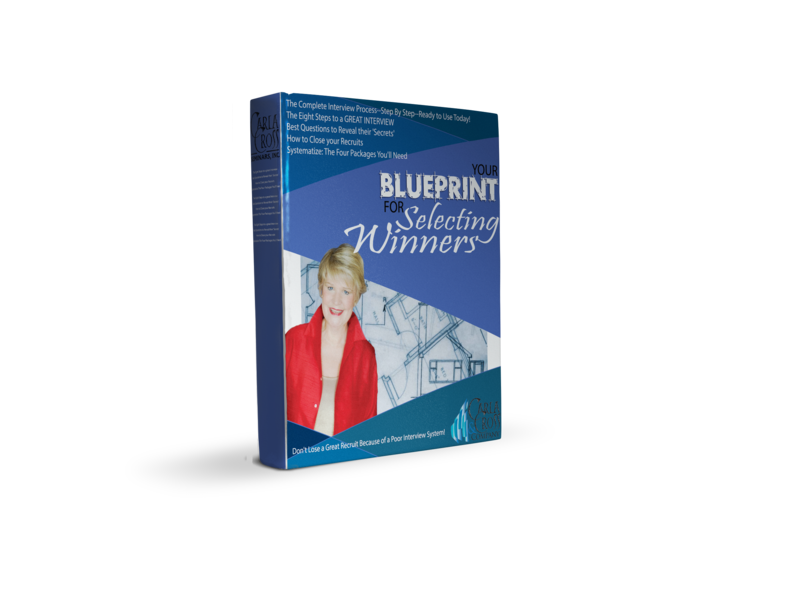 Check out Your Blueprint for Selecting Winners–the questions, the processes, and the systems you need to put your recruiting on the right track! 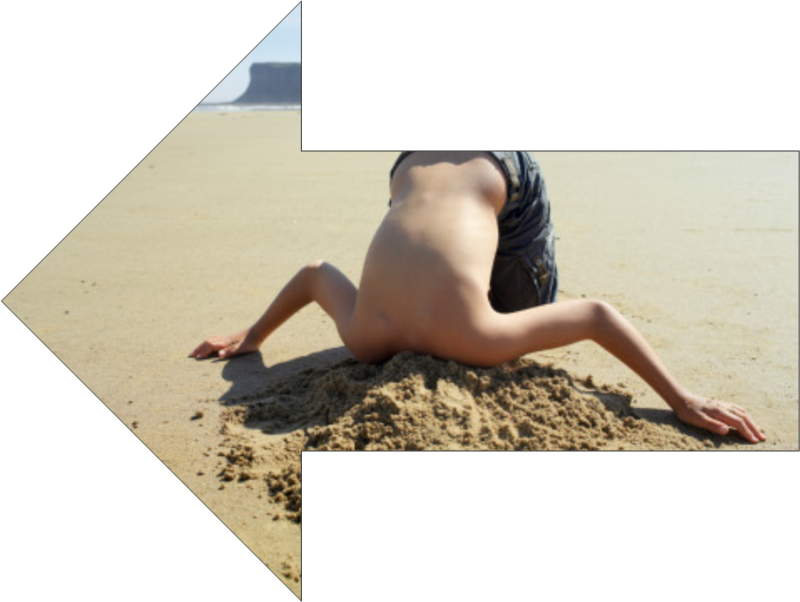 Are Your New Agents ‘Slow and Crawling’? As managers and recruiters, we’re looking for new agents who want to make money fast. So, from one perspective, we’re pleased when the new agent sitting in front of us tells us that he expects to make $100,000 his first year in real estate. My survey of 155 new agents has shown that most agents coming into the business today have high expectations. 92% of the new agents surveyed “planned” to make more than the median income of all Realtors. The most stunning statistic, though, from these new agents, was that 65% expected incomes way above the average Realtor –their first year in the business!A� What does that mean to us managers and trainers? We need to have a a�?start-fasta�� program to delivera��or these agents will be at another company or out of the business way before they get even one sale! Focused on Business Developmenta��or Training? Is Your Activity Plan Supportinga��or Inhibiting Success? Look at your new agent orientation checklists, training schedules, and assignments.A� Think of training and new agent business plans as two separate areas. That business plan for the new agent should be at least as important as the information and practice they receive in the training school. It should put them to work and get them into the field their second week in the business. Otherwise, theya��ll never reach their goals. If the new agent expects high earnings fast, what did his manager expect from him?A� Most of the respondents from the survey didn’t know.A� 71% of the respondents didn’t know even the minimum expectations of their managers–the minimum production standards they would have to meet to have their contracts renewed the second year. To assure that the new agent and manager see ‘eye to eye’, put mutual expectations in writing in the interview period. Show the prospective agent the exact business activity plan* that the agent will use to create success, and get agreement that the plan will work–and that the agent will work the plan. Looking for a proven start-up plan to get your agents in the field and producing–right now? 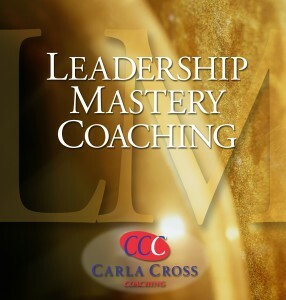 It’s here, now in its new 4th edition (and soon to be an online, training and coaching cource with high accountability!). Click here to see more. It could be to get Joe into production within a certain time period, or help him find a better career fit for himself. It could be to help Joe into that new career right now. I’ll bet Joe is just waiting to see what you will do. After all, you’re the leader…. Whata��s Joea��s value to you? A�What are your next actions? A�Why are you avoiding what you need to do? Dona��t you deserve more than Joe is giving you? In my earlier blog, I told you about “Joe”–that nice agent who never sells a stick of real estate. He’s your billboard. Joe the Billboard publicizes the outcomes from your recruiting, training, and coaching–just by being “Joe”. After you read these, I hope you’ll consider any more ‘Joes” as potential hires as RED FLAGS. Here are the outcomes to your efforts that Joe publicizes for you. Recruiting. You find it hard to recruit. See, likes attract. People see that Joe (or lots of Joes) are in your office. Agents do search the MLS to find out what the sales statistics are in offices. (Why would good agents go to an office that has low production?) Maybe youa��re like me, taking over a real estate office where it was known in the area, literally, as a�?the place you went if you didna��t want to work.a�? Boy, what a great recruiting endorsement!A� If so, you know that ita��s a terrific uphill battle to recruit good people into a bad office. (Hint: You must get rid of the bad people first, then build on a new foundation. You cana��t fool those agents!). Training. Youa��re finding it hard to get agents to attend your training classes. Why? Because Joe attends every one of thema��and then doesna��t take any action. So, your class endorsement is actually a�?those classes dona��t do any good.a�? 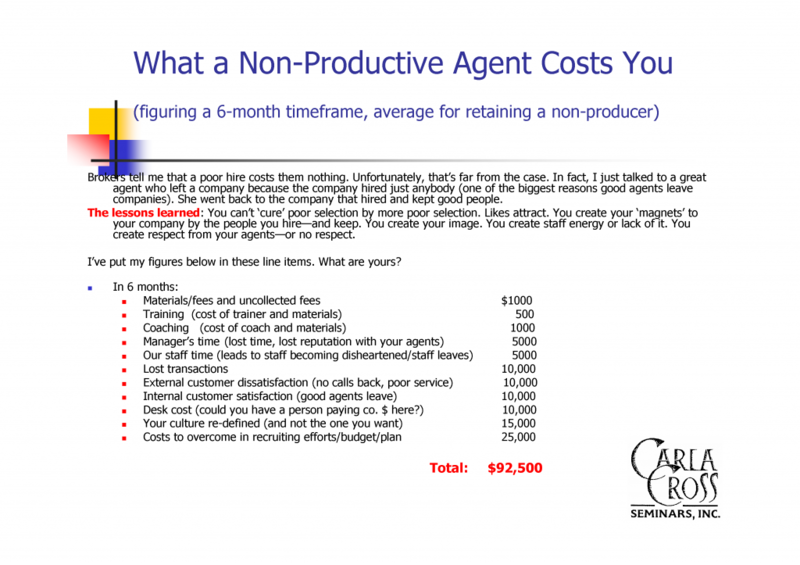 Click here to get my take on how much it costs to hire a non-productive agent. And, do your own math. Are you stunned? What did you learn? What percent of a�?Joesa�? do you have in your office right now? My On Track to Success in 30 Days System for the Experienced Agent is a great way to see if your a�?Joea�� or Josephine really intends to go to worka��and goes to work. Ia��ve provided the link to the agentsa�� and coacha��s program here. It will get agents back in the gamea��with confidence and results.